At Albert Moser Campground, you go to the east end of the campground, and head up a trail that cuts back to the right (south), and climbs for about a mile. Then the trail is rolling for the next mile and a half. You cross a dry creek bed, and then 1/10 mile later you take a left turn in a meadow, and head east on a faint trail. In less than ½ mile you come to a fence. You go left (through a gate). You cross a creek and turn left, heading east. In a little over a mile you come to a 4-wheel road. Go straight onto this road. In a little over a mile, after a bit of a climb, you come to a spring (water trough) to the right. In 1/3 mile you top out on a hill, and head downhill for 2/3 mile. You see a sign ahead. Go left, then left again in 20 yards, heading east. 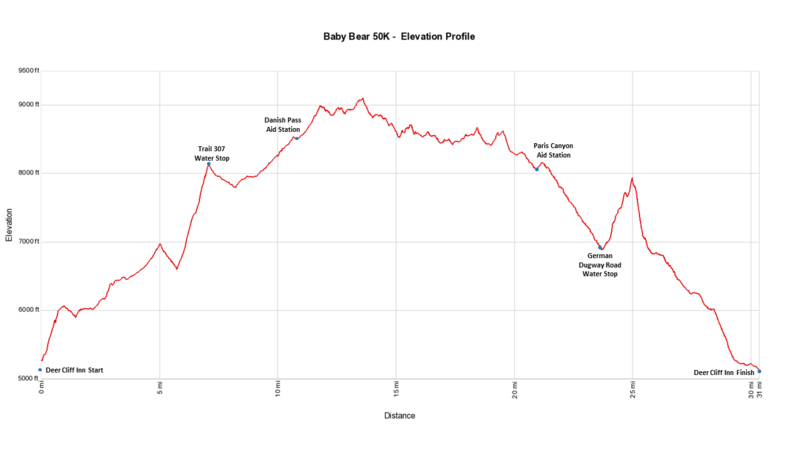 You have a steep climb ahead for about 1 ½ miles. At the top of the climb you come to a 4 wheel road. There should be a water stop here. Go right. In 1 1/3 miles you come to a dirt road. Turn right. In 2/10 mile you see a sign to Danish Pass. Go left. In 3/10 mile the road forks. Take the right fork. In 2/10 mile you take a left turn onto a trail for a short distance, that joins with a dirt road towards Danish Pass. One mile later you take a left turn onto a short-cut trail that take you to Danish Pass 4/10 of a mile later, and the Aid Station. From Danish Pass you head north on the Highline Trail. In less than a mile you come to a sign, go left. In about 3 ½ miles you come to a rock cairn with signs. Continue northward. Any turn here would be a big mistake! In a little over a half mile you see a sign to Bloomington Lake. (0ff to the right) Continue northward on the left fork of the trail. In a little over 2 miles, a trail joins in from the right. Continue northward. In about 2 ½ miles you come to a maze of trails, that cut down to the northeast. Take your pick. They all lead to Paris. (Canyon, that is). About ½ mile after the maze you leave the 4 wheel trail which veers off to the right, and you continue northward on a single track trail. In a little less than a mile you come to the Paris Canyon Aid Station. From Paris Canyon Aid you head west up a dirt road that takes you over the mountain. You soon see a road off to the right. Continue straight for about 2 ½ miles of downhill to the water stop. From here you have the choice of going left down a dirt road for 7 1/3 miles to the finish, or veer off to the right onto a trail (6 2/3 miles to the finish). The trail is very steep in places, and not recommended in wet weather. The trail is fairly level for ½ mile through thick forest, then you turn right and climb up a ridge for a while, then head west (left), and climb up to a ridge heading west. You mostly stay on this ridge until you get to the top of a peak. You then drop down the west side of the peak on a very steep trail (be careful) for ½ mile, then continue westerly on cow trails for another ½ mile. You come to a 4-wheel road. Go left. You stay on the road for 1 ¾ miles, then take a sharp left at the edge of a clear-cut area, onto a trail. You head south on this trail for 1 ½ miles to the Cub River Canyon road. Go right, and in 9/10 mile you are at the finish at Deer Cliff Inn.